Bernal Height's newest (only?) cocktail bar, Holy Water is meant to be a neighborhood bar, but after our visit last week, I think it's well worth a trip from across town. Here, we found some refreshingly simple, classic cocktails beautifully made, some serious tiki favorites, and carefully curated California beers in an enjoyable, casual atmosphere. John Ottoman, below, owns Holy Water, along with a team that was is also involved with Bloodhound, Prize Fighter, and Brass Tacks. John specifically designed this bar to fit into the neighborhood, Bernal Heights, which is known as a cozy community within San Francisco. As a result, the cocktails on the menu are all $9 classics, perfectly executed (no exaggeration––they're flawless). The beer selection is on par with Monk's Kettle in terms of quality. He tries to keep all of his beers local, and they rotate semi-regularly. If you're looking for rare or unusual beers, you'll find them here. (I had a great sour ale, for instance.) The specials also make Holy Water a great local spot or destination. If you can't read it, that sign says "Shot + Beer $7." Now meet some of the cocktails! Turf Club: gin, french vermouth, maraschino, orange bitters. If I had to choose one drink to prove that John Ottoman is a master of his craft, I'd pick the Turf Club. A bit of a riff on the martini, it has that same clean, crisp character—with a bit more sweet flair from the maraschino. Jungle Bird: black rum, pineapple, Campari, lime. I've always loved the Jungle Bird, but I've never had one quite like this. They use a brighter pineapple at Holy Water, which makes the drink taste brighter than usual. The brightness of the pineapple complements the Campari perfectly, leaving you with a semi-dry, pineappley finish. It's fantastic. Mexican Firing Squad: tequila, grenadine, lime. This is another drink that left me floored. The three ingredients were so expertly mixed that the drink tasted better than the sum of its parts. The Mexican Firing Squad, like the other drinks, is bright and crisp. 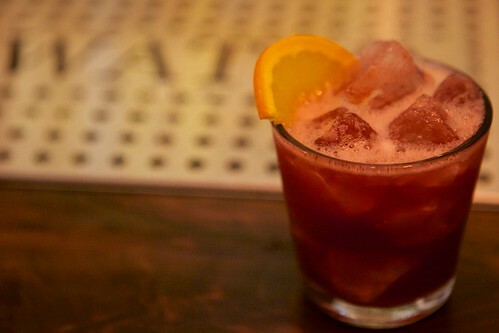 The tart grenadine and smoky mezcal leaves you smacking your lips and going back for more. After the Gold Rush: bourbon, pineapple, apricot, lime. Following the flavor profile of the other drinks, the After the Gold Rush cocktail is bright and clean. The bourbon complicates it, though, adding a more richness to the cocktail. Absolutely delicious. All in all, Holy Water is either the perfect neighborhood spot or a destination well worth the trip. 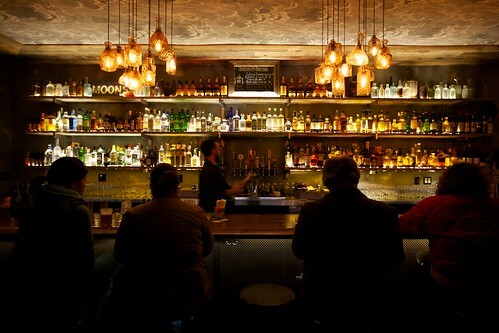 It's vibe is casual, beer selection epic, and cocktails endlessly pleasing. Go to there as soon as you can. Open Mon - Fri, 4 p.m. - 2 a.m.; Sat & Sun, 2 p.m. - 2 a.m. This is a fine recommendation, thank you!